A glance at a bush can sometimes take one world-wide. 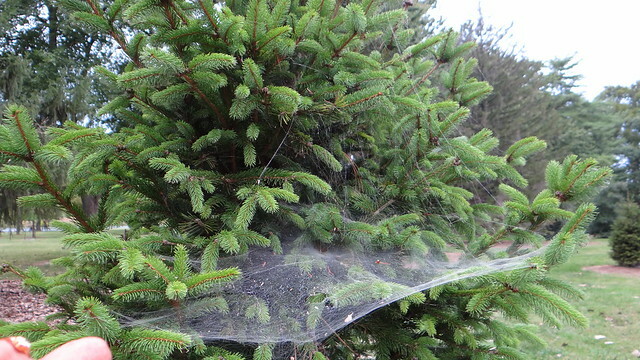 I looked at the wide-flung webs on the various bushes, and thought back to all the similar spiders I’ve seen in India, too. 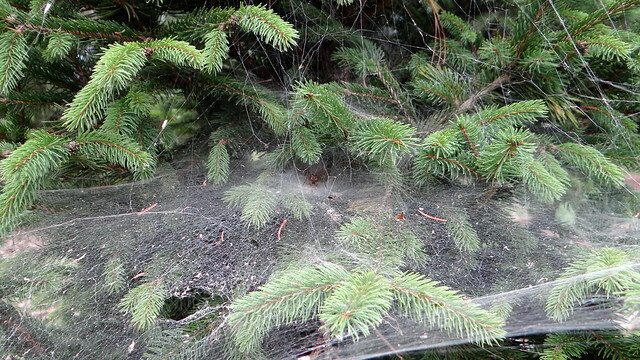 is one of my posts about Indian Funnel-web Spiders (we also call them Wolf Spiders). I decided to read up a little about them, and found out that they are of the family Agelenidae, and there could be more than 1,200 species in 68 genera, worldwide. They seem to occur in every continent except the Poles. 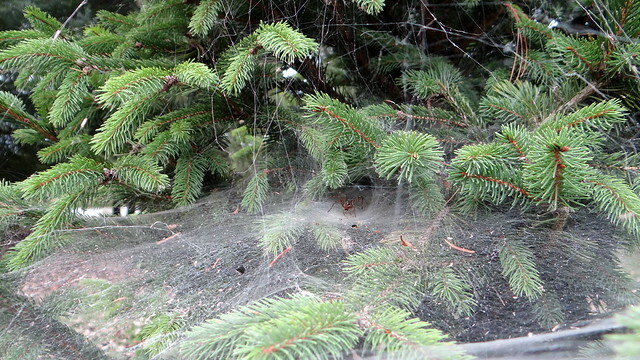 These spiders' social structure is sufficiently evolved, the Wiki says, to include "communal web-building and sharing; cooperative prey capture and communal rearing of young. Spiders have not, however, taken the final step into the eusociality of the social Hymenoptera (ants, bees and wasps) because there are no workers or soldiers (no castes) and all females are reproductive." 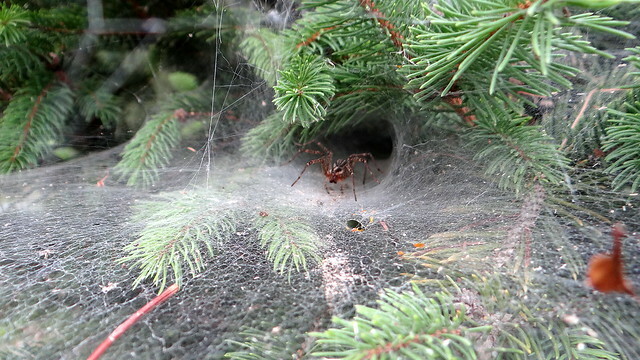 I've seen this kind of social behaviours in Social Spiders, and documented it in my posts here But did not know that Funnel-web Spiders, too, exhibit the same kind of one-for-all-and-all-for-one behaviour. 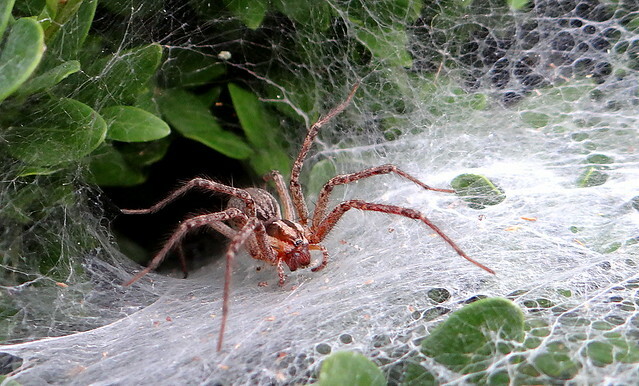 Another amazing fact that I learnt was that these spiders are incredibly fast; "with speeds clocked at 1.73 ft/s (0.53 m/s), the Giant house spider held the Guinness Book of World Records for top spider speed until 1987," says the Wiki! 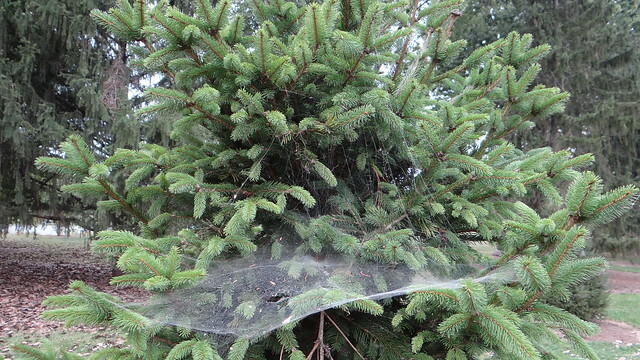 A creature that does, indeed, have a www….World-Wide Web, occurring everywhere…and which is so interesting….that’s the Funnel-web Spider, for you!